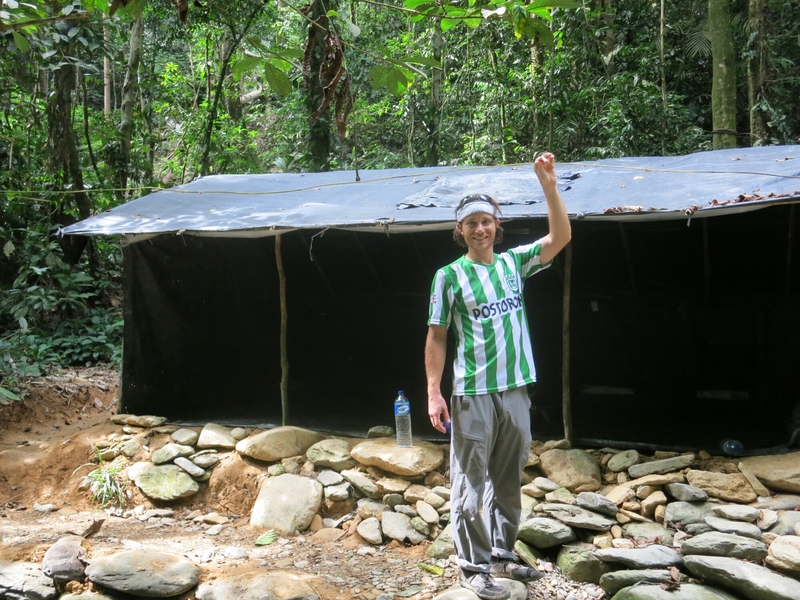 I didn’t get a good impression from the moment we shook hands with our somber “guide” Darwin, who arrived 15 minutes late at Green Hill guesthouse in Bukit Lawang. No smiles from him as he mumbled unintelligible instructions and began walking away. Thirty minutes into the hike when we had our first conversation, I wasn’t even sure if was actually a guide. 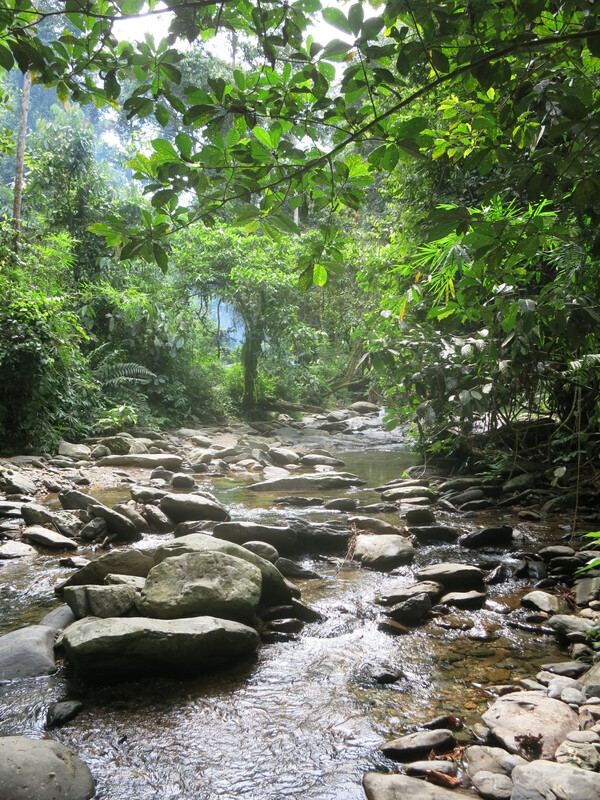 So the three day “trek” into Gunung Leuser National Park in Northern Sumatra, Indonesia went. Although I’d hardly call it a trek, since we maybe walked (at a snail’s pace) 8 kilometers in three days, stopping every 20-30 minutes so Darwin could smoke another cigarette. On the bright side, at least he didn’t throw his cigarette butts onto the ground still lit, as most of the other guides did. We would walk hours without even having a word uttered by our clueless guide, the silence broken by my questions. “How long do these centipedes grow” I’d ask. His answer: not long. My personal favorite: “What is this fruit?” I asked holding up a fleshy orange fruit. “Fruit, to eat” he muttered over his fifth cigarette of the day. In this span of time he never actually identified one plant or animal, all of the animals we saw either Ben or I identified or we wandered into another group of tourists peering up to the trees at a group of Orangutans. 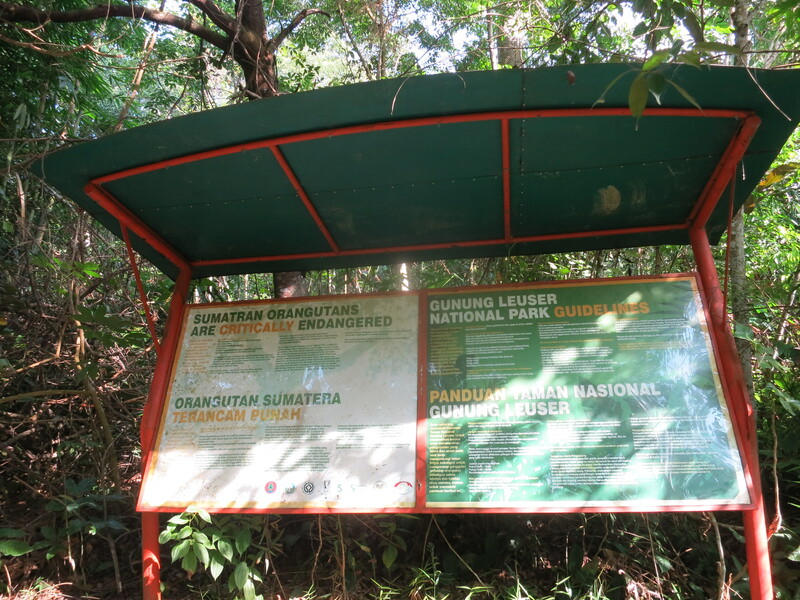 We sadly left Northern Sumatra knowing the same amount about it as we left, which is basically nothing. On the third day we were exhausted after sleeping directly on the hard rocks under our makeshift tent we were just ready to get back to civilization, air conditioning, and soft beds. Wreaking of sweat and cigarettes thanks to the chain smoking Darwin, we climbed onto the black plastic innertubes which took us down river to Bukit Lawang. 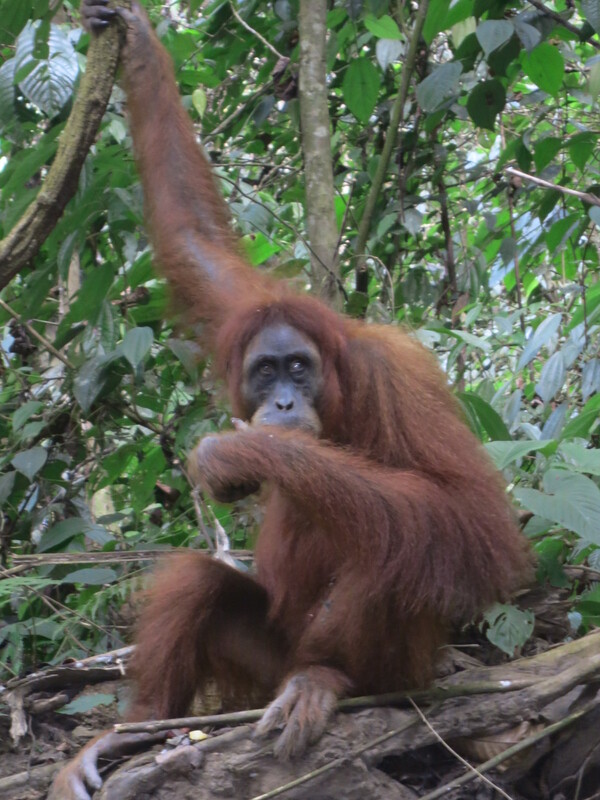 Although I’m not quite sure what we paid €90 each for, I am thankful to have seen the Orangutans up close, which in itself brings up a moral dilemma. We saw Orangutans on four different occasions throughout the trek, sometimes we were within 15 feet of the loveable red-coated creatures. Jackie a semi-wild female was so human-like as she reached for the pineapple a guide handed her and her adorable little baby as he stood directly next to her, basically touching her. 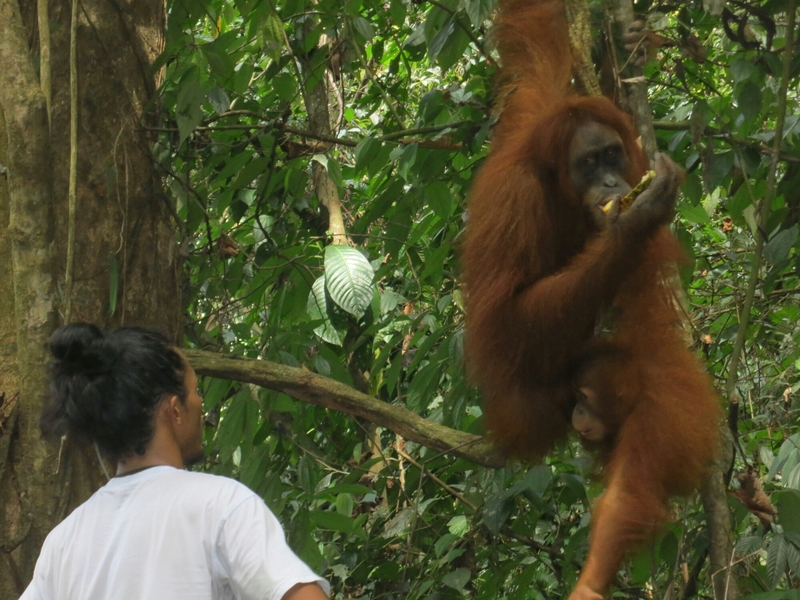 Instead of viewing Orangutans from afar, the neglectful guides lure them down with pieces of fruit while chain smoking so that the eager tourists can get their photographs. How can I judge? I stood there awe struck at the kind eyes of these gentle animals, furiously snapping the photos below. I witnessed so many disgusting behaviors from guides and tourists alike during our time there. Tourists and guides throwing cookies (or biscuits to the Brits) to a gang of Macaques, guides throwing cigarette butts and trash into the same river the entire town of Bukit Lawang drinks from, people leaving excrement and toilet paper directly next to the water. It’s no wonder that the Sumatran tiger and Rhinoceros are on the Critically Endangered Species list. Then again I guess that’s just the way it usually goes, people living in poverty are more concerned about putting food on the table than conserving nature. As Ben walked around the campsite collecting trash and the guides rolled their eyes he said, “Someone ought to tell these guys if this place gets too trashed no one will want to come or the government will be forced to restrict traffic into the park. What will they do for income then?”. Let’s hope someone can educate them before it’s too late. not the best expierience you have made.